If this sounds chaotic, overall, design lines are kept modern and simple, which should balance out the effusive use of pattern and color. In any event, black wardrobe works just fine to attend Edinburgh's Fringe Festival, the largest arts festival in the world which goes off August 7th-31st-- always a late summer highlight. With its central location, Hotel Missoni should make a fine base of operations for the festival, and as of now, still has rooms available. 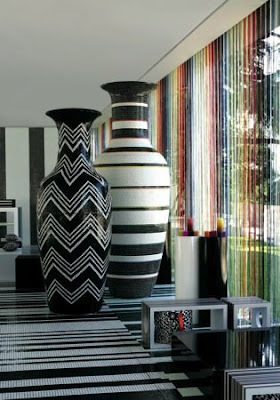 Next up for the Hotel Missoni brand? A property in Kuwait, slated to open in Fall 2009.